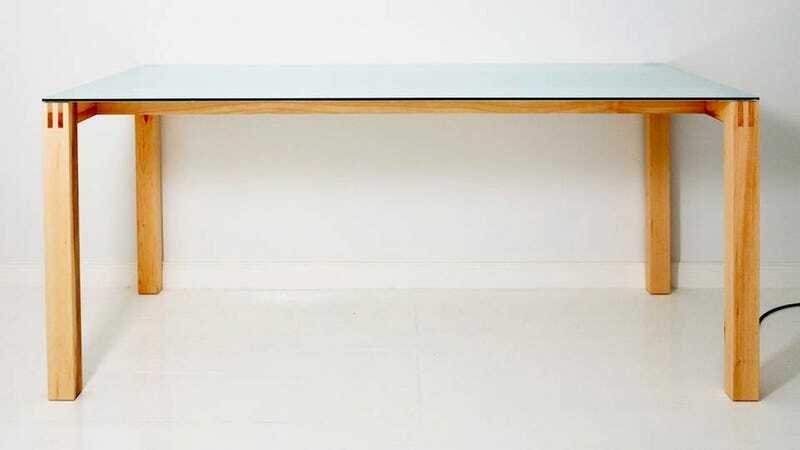 Where Is This Beautiful Table Hiding an AirPlay Speaker? If you hate the thought of having a set of speakers mucking up the minimal aesthetics of your home—but still love to entertain—this simple glass-topped wooden table doubles as an AirPlay compatible speaker. It's just too bad the cost of keeping your electronics out of sight is a whopping $5,800. You're probably wondering where the Kaikuuu01 actually hides the speaker and electronics given its thin wooden legs and frame. But the secret is that it's not actually hiding any speakers. Instead, it uses a resonating device to produce sound using the glass table top. Unfortunately that means that having anything on the table will muffle the sound, which is a bit of an inconvenience—not being able to always use the table you've spent almost six grand on. But as long as you don't have your heart set on dining with Dido, this is certainly a clever way to incorporate a stereo into your decor.